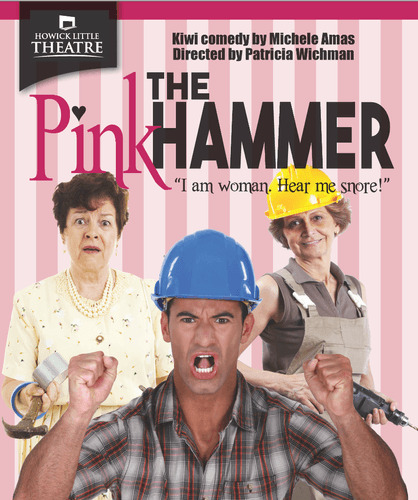 The play is set in a "well-loved builder's workshop - a shrine to masculinity". Four women turn up looking for Maggie Taylor’s promise of empowerment through basic carpentry skills, chiselling away the stereotype that "tools and building is a man’s job". Only, someone forgot to tell Woody. It’s his shrine, and now he finds himself up against four very different women demanding the service they paid for. - Woody (30-40s): a recently made redundant carpenter; empowerment sounds like something you plug into a wall socket – wants to build an exit for these bloody women! - Annabelle (40-50s): an active feminist turned counselor - she wants to build a Victorian style cabinet. - Louise (40-50s): a nurse, caring for her elderly parents when she’s not at work - she wants to build herself a small house. - Helen (50-60s): prefers horses to people, never married, two grown-up sons - she wants to build a coffin. This will be Patricia’s first production with Howick Little Theatre and she looking forward to bringing her experiences as an actress and director in stage and screen to the other side of town.